An oral nerve block is a simple and effective way to manage orofacial pain without distorting the anatomy of a wound and without the use of narcotics. This article highlights the indications, equipment, contraindications, complications, and approach to performing the more commonly used oral nerve blocks. The technique section displays a step-by-step method for each block; illustrations depict the area to be anesthetized and the position of the needle in relation to the anatomy. Topical anesthetics are used to reduce the pain caused by needle insertion. Benzocaine 20% (eg, Hurricaine spray, Orajel): Use caution and monitor patient for methemoglobinemia. Dry the mucous membranes with gauze over the site to be anesthetized. Place a generous amount of topical agent onto cotton-tipped applicators. Apply the topical agent over the mucosa for approximately 3 minutes. *NOTE: Do not use tetracaine/Adrenalin/cocaine (TAC) or other cutaneous preparations on mucous membranes; severe systemic toxicity can result. For more information, see Anesthesia, Topical. Lidocaine (1% or 2%) and bupivacaine (0.25%) are the 2 most commonly used local anesthetics. Lidocaine is preferred for indications such as laceration repair because of its shorter duration of action. Bupivacaine is preferred for indications such as toothache or mandibular fracture because of its longer duration of action. Note that anesthetics are divided into 2 classes: amide and ester. These can be substituted for each other if the patient has an allergy to one type. For more information, see Local Anesthetic Agents, Infiltrative Administration. Avoid using local anesthetics in at-risk patients (eg, those with cardiovascular disease). For more information, including local anesthetic toxicity, see Toxicity, Local Anesthetics. For information on calculating appropriate amounts of local anesthetic/epinephrine, please refer to the Calculating Concentrations and Dilutions section below. Inferior alveolar nerve block: For this procedure, the patient should be seated, with the head firmly against the head rest, positioned so that when the mandible is open, the body of the mandible is parallel to the floor. Nasopalatine and greater palatine nerve blocks: For these procedures, place a rolled sheet beneath the patient’s shoulders to assist in neck extension of 45 degrees. Landmarks: Locate the mucobuccal fold above the tooth to be anesthetized by grasping the membrane with gauze and pulling out and down for maxillary locations and out and up for mandibular locations. Apply topical anesthetic as described in the Anesthesia section. 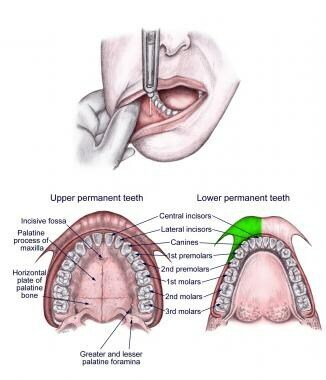 Approach: Insert needle into the mucobuccal fold with the bevel facing bone, aligned with the center of the tooth to be anesthetized, aimed toward the maxilla. Contact the maxilla, then withdraw the needle 1 mm. Slowly inject 1-2 mL of local anesthetic at the apex of the root tip. Anterior superior alveolar (ASA) nerve block. Landmarks: Locate the mucobuccal fold where it intersects with the apex of the canine (cuspid) tooth by retracting the membrane with gauze and pulling out and down. Approach: While retracting the lip, insert the needle into the intersection of the mucobuccal fold and the apex/center of the canine at a 45-degree angle, advancing the needle approximately 1-1.5 cm. Slowly inject 2 mL of local anesthetic and massage for 10-20 seconds. Middle superior alveolar nerve (MSA) block. Landmarks: Locate the mucobuccal fold where it intersects with the junction of maxillary premolar 2 and molar 1. Approach: While retracting the cheek, insert the needle into the aforementioned intersection point at a 45-degree angle, and advance 1-1.5 cm. Slowly inject 2-3 mL of local anesthetic and massage for 10-20 seconds. Posterior superior alveolar (PSA) nerve block. Landmarks: Start with the jaw half open and swung toward the operator. Retract the cheek laterally and locate the intersection of the mucobuccal fold and the junction of molars 1 and 2. Approach: Insert the needle into the intersection and direct it toward the posterolateral maxillary tuberosity (up, back, and inward) along the curvature or the maxilla and to a depth of approximately 2-2.5 cm. If the needle contacts bone, withdraw and redirect more laterally. Slowly inject 2-3 mL of local anesthetic. An infraorbital nerve block, which branches from the maxillary nerve, anesthetizes the lower eyelid, upper cheek, part of the nose, and upper lip (see image below). The ASA nerve, which innervates the maxillary canine, the central and lateral incisors, and the mucosa above these teeth, with occasional crossover to the contralateral maxillary incisors, also branches from the maxillary nerve, proximal to the infraorbital nerve. [2, 6, 1, 8] Because of this anatomy, anesthetizing the infraorbital nerve can result in some overlapping anesthesia of the ASA nerve or vice versa. However, anesthetizing one of these nerves does not guarantee anesthesia of the other. Landmarks: Externally, the intraorbital foramen is just medial to the intersection of a vertical line from the pupil (when midline) to the inferior border of the infraorbital ridge. Internally, the intraorbital foramen is approached at the intersection of the mucobuccal fold and the junction of premolars 1 and 2. Approach: Place the index finger of the nondominant hand over the above the intersection mentioned above (ie, the infraorbital foramen) and retract the cheek with the thumb. 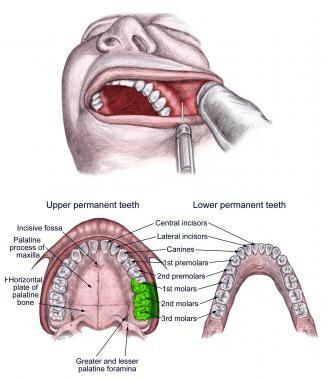 Insert the needle into the mucobuccal fold at junction of premolars 1 and 2. Direct the needle parallel to the long axis of premolar 2, palpating its location as the needle is advanced until it is adjacent to the infraorbital foramen (approximately 1.5-2 cm). If the needle is directed at an angle that is too acute, it will hit the maxillary eminence; if directed at an angle that is too superior, the needle will enter the orbit. Inject 2-3 mL of local anesthetic while holding firm pressure with the index finger over infraorbital ridge to prevent ballooning of lower eyelid. Massage for 10-20 seconds. Landmarks: The location for this injection is 0.5 cm posterior to the central incisors at the midline. 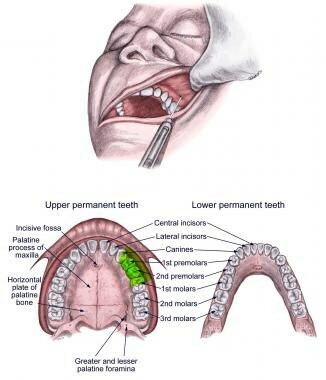 Look for a slight soft tissue elevation; this is the incisive papilla, which overlies the incisive foramen. 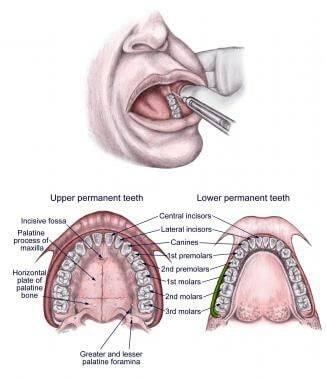 Approach: Insert needle with the bevel facing the hard palate just lateral to incisive papilla. Advance 3-4 mm medially or until the needle contacts bone. Inject 0.25-0.4 mL of local anesthetic. Do not inject more than this because it can cause separation of the mucosa from the palate and subsequent tissue necrosis. Landmarks: The greater palatine foramen can be identified by finding the junction of molars 2 and 3 and then moving the needle 1 cm medially. Approach: Insert the needle adjacent to the greater palatine foramen, at a 90-degree angle to the curvature of the hard palate. Do not advance further. Inject 0.3-0.5 mL of anesthetic. Do not inject more than this because it can cause separation of the mucosa from the palate and subsequent tissue necrosis. Landmarks: Start by standing contralateral to the side to be anesthetized. Place the thumb in the mouth, and place the index finger externally and posterior to the ramus (angle of the jaw). Retract cheek laterally and palpate the retromolar fossa to find the greatest depth of the anterior border of the ramus; this is the coronoid notch. Approach: With the patient’s jaw open, align the barrel of the syringe with occlusive surfaces of the teeth, angled between the first and second premolars on contralateral side (the syringe must be thus aligned for a successful nerve block). 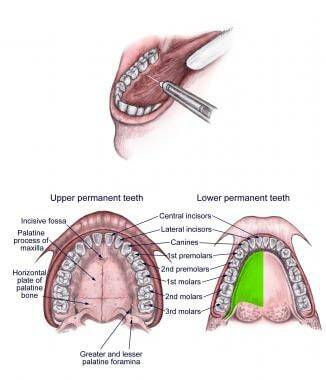 Insert the needle 1 cm above the occlusive surface of the teeth in the triangle at the lingula. The lingula is a bony projection on the medial surface of the ramus 1 cm above the occlusive plain. The goal is to insert the needle just superior and posterior to the lingula; if the needle is inserted too low, anesthesia does not occur. Stop insertion when the needle strikes the bone but not before. Withdraw the needle 1-2 mm. Inject 2-4 mL of local anesthetic. Because of its close proximity to the inferior alveolar nerve, the lingual nerve is usually also anesthetized with this technique. Landmarks: To locate the mental foramen, retract the cheek and lip and locate the junction of mandibular premolars 1 and 2 and down 1 cm inferior to the gum line (just medial to the midline pupil). Note that this is in the same line as the infraorbital foramen. 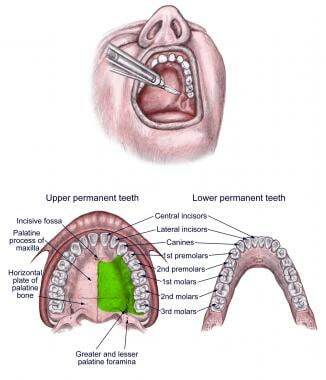 Approach: Insert the needle 1 cm inferior to the second premolar at a 45-degree angle. Advance until the needle contacts the mandible. Withdraw the needle slightly. 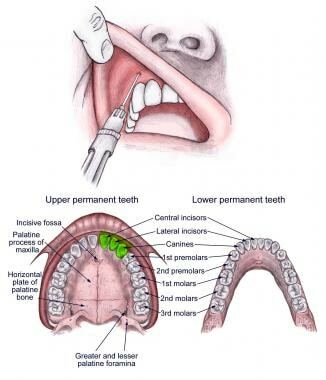 Inject 1-2 mL of anesthetic adjacent to the foramen and massage for 10-20 seconds. 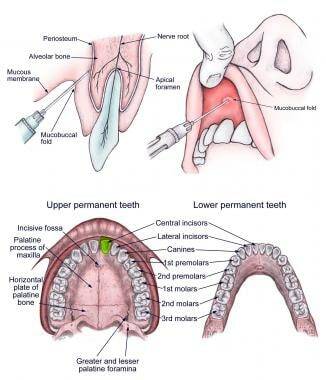 Landmarks: The lingual nerve is located on the lingual side of the second mandibular molar. Approach: Stand on the contralateral side. 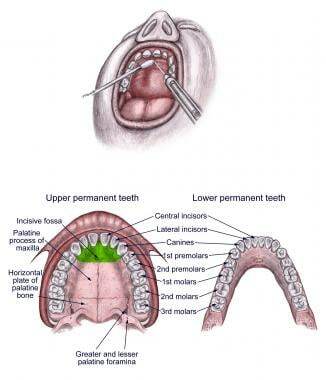 Lift the tongue with a tongue blade and insert the needle 1 cm below the gumline of the second mandibular molar. Advance posteriorly 1 cm. Inject 1-1.5 mL of local anesthetic. Landmarks: Locate the buccal nerve 1 mm lateral to mandibular molar 3 at the anterior border of the ramus in the occlusive plane. Approach: With the thumb of the nondominant hand, pull the cheek laterally. Insert the needle into the anterior border of the ramus 1 mm lateral to the third mandibular molar and in line with the occlusive plane. Advance the needle 3-4 mm. Slowly inject 2 mL of local anesthetic. Always remember to obtain informed consent prior to performing a nerve block. In order to aspirate properly, use a needle that is 27 gauge or larger for deep nerve blocks. Applying pressure to the site adjacent to injection while inserting the needle may distract the patient and, thereby, decrease the sensation of pain. Massaging tissue for 10-20 seconds is thought to hasten the onset of local anesthetic. Achieving anesthesia with oral nerve blocks may take as long as 10 minutes. If the first attempt at the nerve block fails, try the block again. Some of the blocks (ie, inferior alveolar, infraorbital) are best attempted after a skilled clinician has demonstrated them. Insert the needle over the infraorbital foramen, penetrating just beneath the subcutaneous tissue but not into the foramen. Slowly inject 1-2 mL of local anesthetic while holding pressure over the infraorbital ridge to prevent ballooning of the lower eyelid. Massage the area for 10-20 seconds. Place the nondominant thumb on the inner surface of the cheek and retract the cheek laterally. 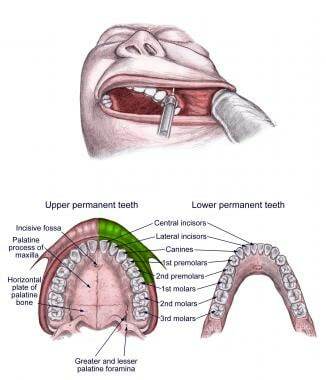 Place the syringe parallel to the occlusive plane at the level of the maxillary molars and their gingival junction. Direct needle just medial to the ramus and advance 3 cm. Inject 3 mL of local anesthetic. Trismus and deep space infections can result if the needle is inserted through infected tissue. When the overlying tissue is infected, use only superficial or local infiltration for anesthesia. While experiencing the lack of sensation caused by a nerve block, patients can injure themselves without realizing it. Advise patients to avoid hot beverages and refrain from biting the anesthetized area to test sensation (this is particularly important for pediatric patients). Toxicity can result from the local anesthetic or epinephrine, either from an overdose or from an intravascular injection. For more details, please see Emergency Medicine article Toxicity, Local Anesthetics. If the needle is inserted into the nerve or if anesthetic is injected into a foramen/nerve, neurologic damage can occur secondary to either pressure necrosis or chemical injury. Paresthesias or a sudden increase in pain indicates that the needle is within the nerve bundle. If this occurs, withdraw the needle by 1-2 mm, wait for the paresthesias or pain to subside (10-20 s), and then inject. Hematomas can form if a venus plexus or arterial supply is interrupted by the needle. Treatment consists of cold packs during the first 24 hours, then hot packs to help disintegrate the clot. These are usually of no consequence. Attempts to force the needle, inserting the needle to the hub, or redirecting the needle after insertion may result in needle breakage. Failure to achieve anesthesia is a possible complication. This complication is usually secondary to the anesthetic not penetrating the cortex of the bone either because it was deposited too far from periosteum or because the cortex is too thick. Therefore, this type of block works best for teeth with thin cortical bone (ie, maxillary incisors, canines, premolars). It doesn’t work as well for the maxillary molars or mandibular teeth in adults because of their thicker bone cortex. Breaching the nasal cavity or maxillary sinus can occur if the needle is inserted too deeply during an attempt to block the maxillary incisors or canines. Advancing the needle too far posteriorly during an attempted posterior superior alveolar nerve block blocks the maxillary nerve. Violation of the orbit can occur if the needle is advanced too far superiorly. To avoid this, make sure to palpate the position of the needle with the nondominant index finger as the needle is advanced. Use the following example to determine the maximum mL allowable using 1% lidocaine in a 70 kg male patient. 1% = 1000 mg/100 mL = 10 mg/mL of solution. Maximum dose of lidocaine without epinephrine is 4.5 mg/kg. 4.5 mg/kg x 70 kg = 315 mg of lidocaine for the maximum allowable dose. 315 mg ÷ 10 mg/mL = 31.5 mL of 1% lidocaine solution for the maximum allowable dose. The concentration 1:100,000 means 1 g epinephrine in 100,000 mL solvent (ie, 1000 mg/100,000 mL or 1 mg/100 mL). Therefore, 1:100,000 = 0.01 mg/mL epinephrine = 10 mcg epinephrine/mL of solution. What is an oral nerve block? What are the indications for an oral nerve block? What are the contraindications for an oral nerve block? What is the role of topical anesthetics in the administration of an oral nerve block? Which anesthetic agents are used in an oral nerve block? What is the role of epinephrine in an oral nerve block? What is the efficacy of ropivacaine for oral nerve block? Which equipment is needed to perform an oral nerve block? How is the patient positioned for oral nerve block? How is the supraperiosteal infiltration oral nerve block performed? How is the anterior superior alveolar (ASA) nerve block performed? How is the middle superior alveolar (MSA) nerve block performed? How is the posterior superior alveolar (PSA) nerve block performed? How is the infraorbital nerve block performed? How is the nasopalatine nerve block performed? How is the greater palatine nerve block performed? How is the inferior alveolar nerve block performed? How is the mental nerve block performed? How is the lingual nerve block performed? 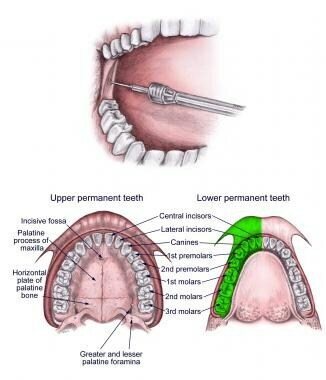 How is the buccal nerve block performed? What are pearls for performing oral nerve blocks? What are pearls for performing infraorbital nerve block? What are pearls for performing anterior superior alveolar nerve block? What are pearls for performing inferior alveolar nerve block? What are pearls for performing posterior superior alveolar nerve block? What are the possible complications of oral nerve block? What are the possible complications of supraperiosteal nerve block? What are the possible complications of posterior superior alveolar nerve block? What are the possible complications of nasopalatine nerve block? What are the possible complications of greater palatine nerve block? What are the possible complications of inferior alveolar nerve block? How is a 1% lidocaine concentration for oral nerve block calculated? Amsterdam J, Kilgore K. Regional anesthesia of the head and neck. Roberts JR, Hedges J. Clinical Procedures In Emergency Medicine. 4th ed. Philadelphia, Pa: WB Saunders; 2003. 552-66. Kämmerer PW, Palarie V, Daubländer M, Bicer C, Shabazfar N, Brüllmann D, et al. Comparison of 4% articaine with epinephrine (1:100,000) and without epinephrine in inferior alveolar block for tooth extraction: double-blind randomized clinical trial of anesthetic efficacy. Oral Surg Oral Med Oral Pathol Oral Radiol Endod. 2011 Aug 6. [Medline]. Daubländer M, Kämmerer PW, Willershausen B, Leckel M, Lauer HC, Buff S, et al. Clinical use of an epinephrine-reduced (1/400,000) articaine solution in short-time dental routine treatments-a multicenter study. Clin Oral Investig. 2011 Aug 23. [Medline]. Budharapu A, Sinha R, Uppada UK, Subramanya Kumar AV. Ropivacaine: a new local anaesthetic agent in maxillofacial surgery. Br J Oral Maxillofac Surg. 2015 May. 53 (5):451-4. [Medline]. Reichman E, Kern K. Dental anesthesia and analgesia. Reichman E, Simon R. Emergency Medicine Procedures. 1. Columbus, Ohio: McGraw-Hill; 2004. 1353-67. Crowley C, Drum M, Reader A, Nusstein J, Fowler S, Beck M. Anesthetic Efficacy of Supine and Upright Positions for the Inferior Alveolar Nerve Block: A Prospective, Randomized Study. J Endod. 2017 Dec 2. [Medline]. Larrabee W, Makielski K, Henderson J. Facial sensory innervation. Surgical Anatomy of the Face. 2nd ed. Philadelphia, Pa: Lippincott, Williams & Wilkins; 2003. 85-95. Saha SG, Jain S, Dubey S, Kala S, Misuriya A, Kataria D. Effect of Oral Premedication on the Efficacy of Inferior Alveolar Nerve Block in Patients with Symptomatic Irreversible Pulpitis: A Prospective, Double-Blind, Randomized Controlled Clinical Trial. J Clin Diagn Res. 2016 Feb. 10 (2):ZC25-9. [Medline]. Whitworth JM, Kanaa MD, Corbett IP, Meechan JG. Influence of injection speed on the effectiveness of incisive/mental nerve block: a randomized, controlled, double-blind study in adult volunteers. J Endod. 2007 Oct. 33(10):1149-54. [Medline]. Chakranarayan A, Mukherjee B. Arched needle technique for inferior alveolar mandibular nerve block. J Maxillofac Oral Surg. 2013 Mar. 12(1):113-6. [Medline]. [Full Text]. Stein P, Brueckner J, Milliner M. Sensory innervation of mandibular teeth by the nerve to the mylohyoid: implications in local anesthesia. Clin Anat. 2007 Aug. 20(6):591-5. [Medline]. Forbes WC. Twelve alternatives to the traditional inferior alveolar nerve block. J Mich Dent Assoc. 2005 May. 87(5):52-6, 58, 75. [Medline]. Meyer TN, Lemos LL, Nascimento CN, Lellis WR. Effectiveness of nasopalatine nerve block for anesthesia of maxillary central incisors after failure of the anterior superior alveolar nerve block technique. Braz Dent J. 2007. 18(1):69-73. [Medline]. Cho SY, Choi W, Kim J, Kim ST, Kim HJ, Jung IY. Anesthetic efficacy of an inferior alveolar nerve block in soft tissue and correlation between soft tissue and pulpal anesthesia. Clin Oral Investig. 2018 Jun 25. [Medline].